The Internet is a strange place: some good strange, some bad strange and a whole lot of strange strange. What’s even stranger is that so much of the strangeness involves animals. Cats continue to control the majority of our online viewing time, followed by people tripping down stairs and falling off chairs. Okay, maybe I made up that last part but there’s no debating the abundance of absurd YouTube videos. In the spirit of mind-numbing, no-cost, high-speed hilarity, I thought I’d share five horribly hilarious Halloween pet videos and my take on what makes them so—well, you decide. Did you know someone in school who constantly tried a little too hard to be funny? They really put their best effort into a gag but it always fell a little shy of a snicker? 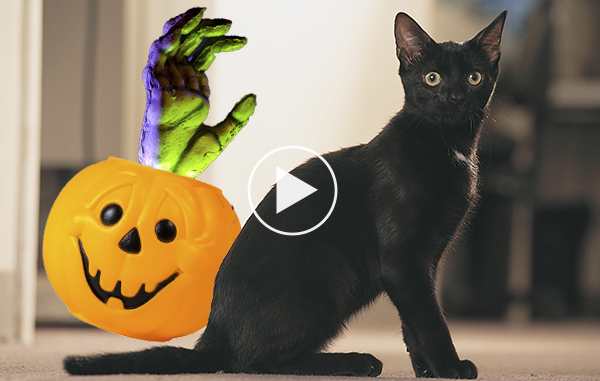 That friend made a Halloween pet video—still not entirely funny. First the good: The production value is off the charts! Go team! Creative camera angles, catchy music, charming children and dapper dogs dressed in costumes—just not so much hilarious. Let’s just say there’s an incredibly clichéd banana-peel slip gag, a warning about not giving dogs chocolate (Click here to learn more about chocolate toxicity), and then shots of the dogs snatching the chocolate candies and escaping that serves only to confuse. In the end, the creators resort to the old, “We did it for animal adoption, go team!” excuse that attempts to make me feel bad for poking a bit of fun of them. Oops. October is Adopt-A-Shelter-Dog month! Click here to learn more about shelter dogs. Click here to learn more about chocolate toxicity. 3) Cute and sometimes scary human females in cat costumes. Then you get this slice of deliciousness—a cat wearing a totally unrecognizable, obviously owner-created monstrosity of a costume while—wait for it—licking a banana! The red-and-white checked tablecloth scarf makes it totally deserving of the 48-seconds of viewing bliss. The banana licking makes it good gracious great! I don’t know who the English “actor” is in this flaming dog poo Halloween prank video, but someone needs to find him a place on Downton Abbey. Maybe I’m exaggerating but only a wee bit. The basic premise of this short (take note YouTubers, brevity is best.) spoof is the aforementioned Brit is mean to our hero dog due to his homemade costume. I really dislike the bad-on-the-bed behavior of the Aussie but it’s so darn cute! The Aussie strikes back in the best-worst possible way. Totally worth the less than two-minutes of viewing time. If your dog really is destroying your sheets or house, click here to learn how to stop it. I LOVE Star Wars. Well, at least the classic Star Wars. I only sort of “like” the newer movies—old school rules. I digress. If you’re wondering why I referenced Star Wars in the first place, you’ve obviously been spending too much time in the Outer Rim Territories. AT-AT refers to the famous All Terrain Armored Transport four-legged walking machines made famous in Episode V, on the snow-covered plains during the Battle of Hoth. Yeah, I’m a geek. This video is simply a happy, but utterly confused tiny pooch parading around a kitchen wearing what appears to be a cardboard AT-AT costume while the videographer drones “The Imperial March (Darth Vader’s Theme).” And laughs. “Judge me by my size, do you?” No, by your awesomeness you are judged. The dog in this video looks very happy, but could your dog actually be embarrassed by a costume? Everyone knows the Internet is powered by cat videos. Like most Earthlings, I’ve spent far too many minutes glued to my phone or computer snickering at the latest kitty capers. Add another minute by viewing this silly smart phone moment of a curious cat investigating a motion-sensing ghoulish hand-in-a-treat-bowl gimmick. The body language and looks of this pumpkin costumed feline are enough to keep the Internet running for another forty years. Done with the videos? Click here for Halloween safety tips.